Ian McCrea Rutherford Appleton Laboratory UK. 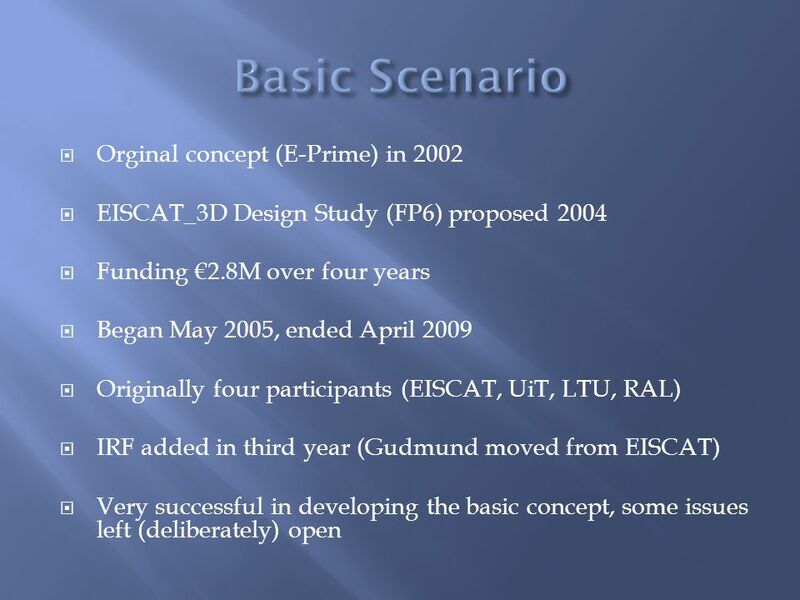  Orginal concept (E-Prime) in 2002  EISCAT_3D Design Study (FP6) proposed 2004  Funding €2.8M over four. 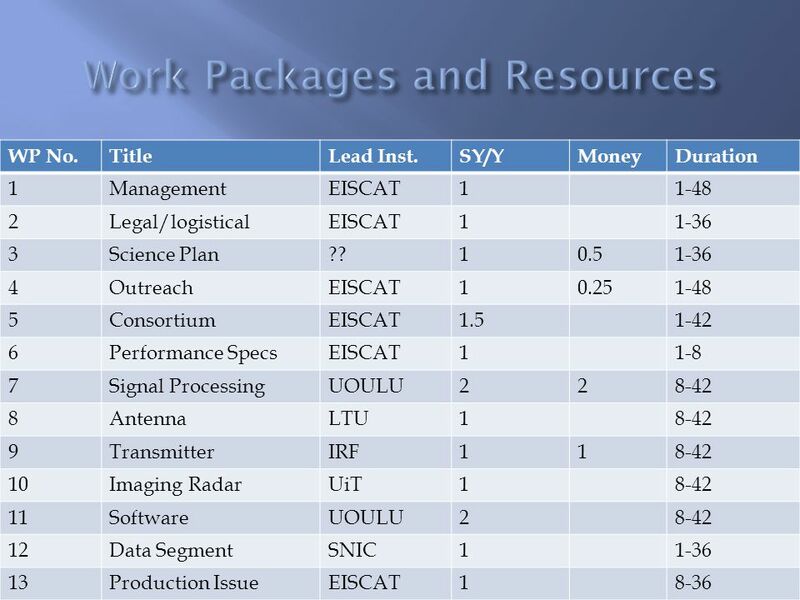 7 EISCAT – Co-ordinates whole proposal. Runs project office. 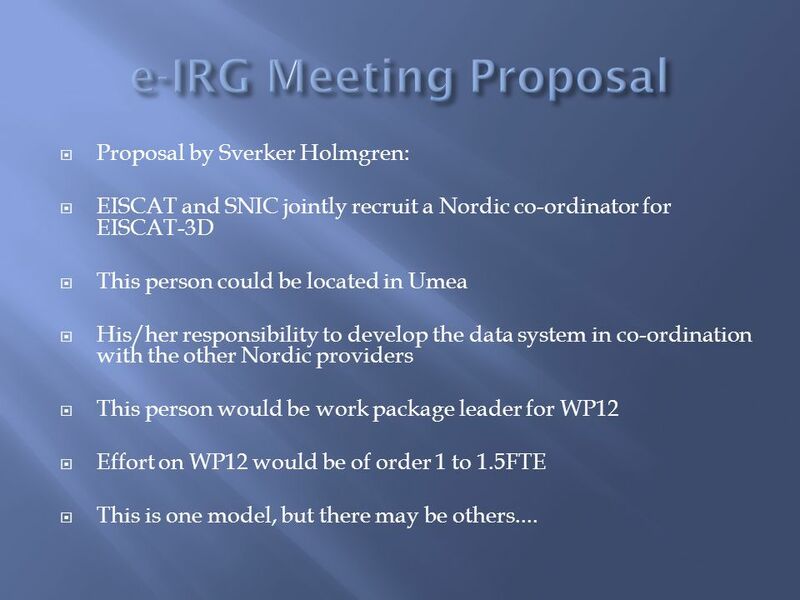 Leads WP1 (Management), WP2 (Legal/logistical), WP4 (Outreach and user liaison), WP6 (Performance Specification), WP13 (Production Issues) IRF Kiruna – Expertise in radar systems design and electronics. Leaders of Swedish national proposal (with Umea). Host institute of Swedish EISCAT staff. 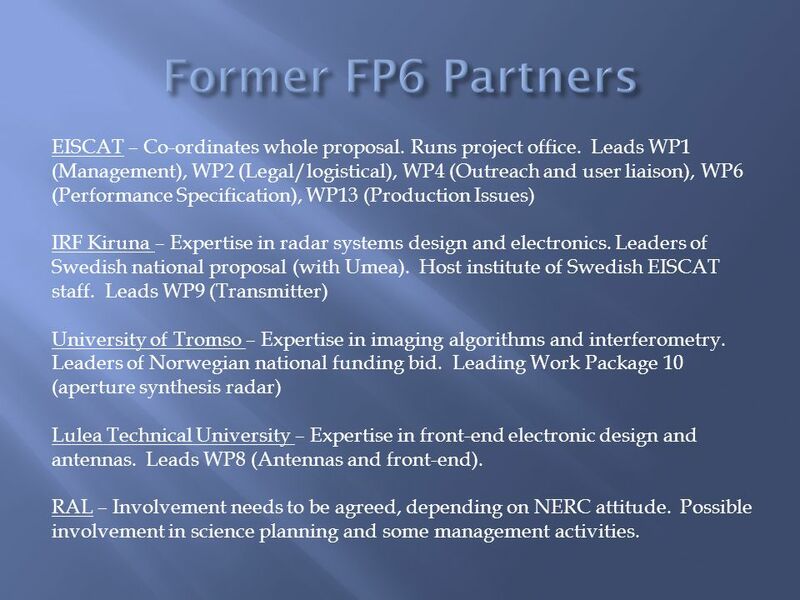 Leads WP9 (Transmitter) University of Tromso – Expertise in imaging algorithms and interferometry. 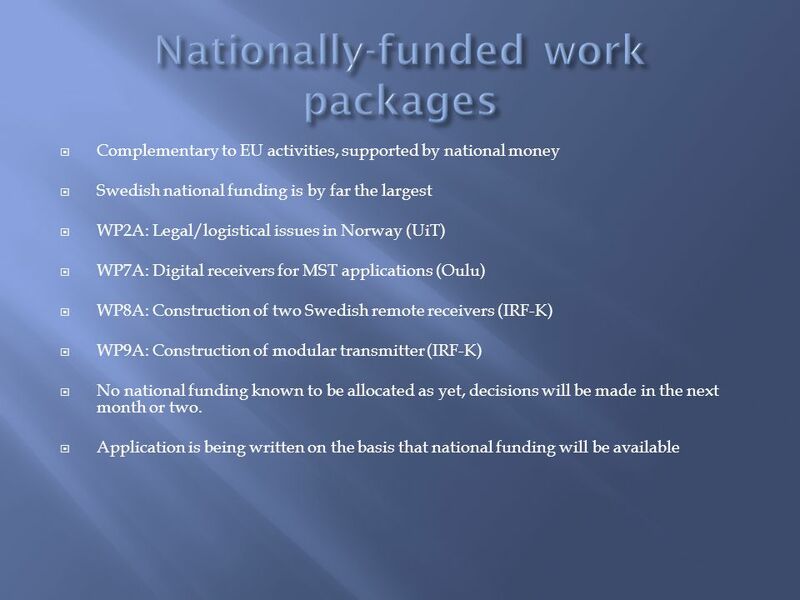 Leaders of Norwegian national funding bid. 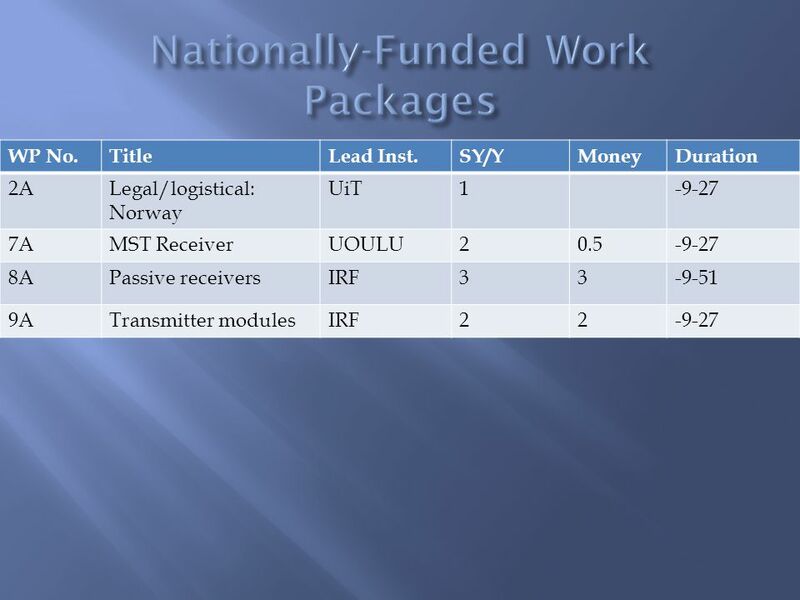 Leading Work Package 10 (aperture synthesis radar) Lulea Technical University – Expertise in front-end electronic design and antennas. Leads WP8 (Antennas and front-end). RAL – Involvement needs to be agreed, depending on NERC attitude. 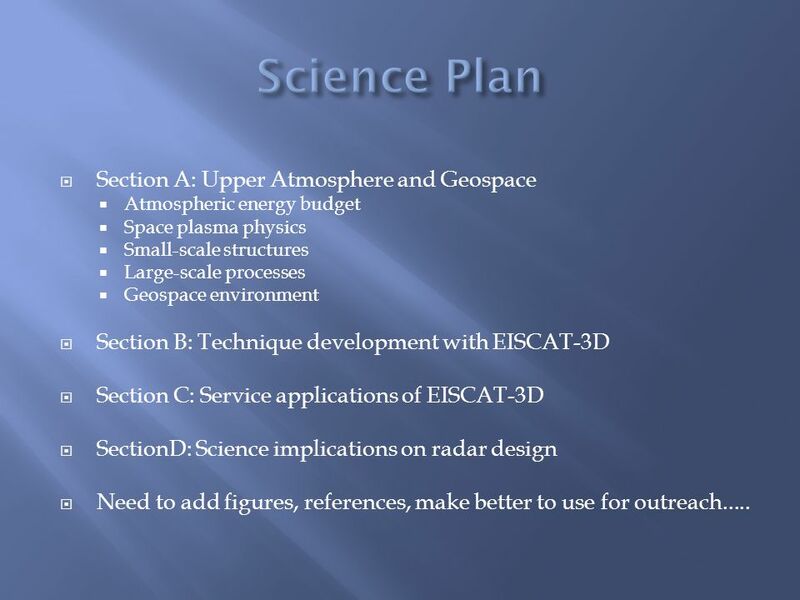 Possible involvement in science planning and some management activities. 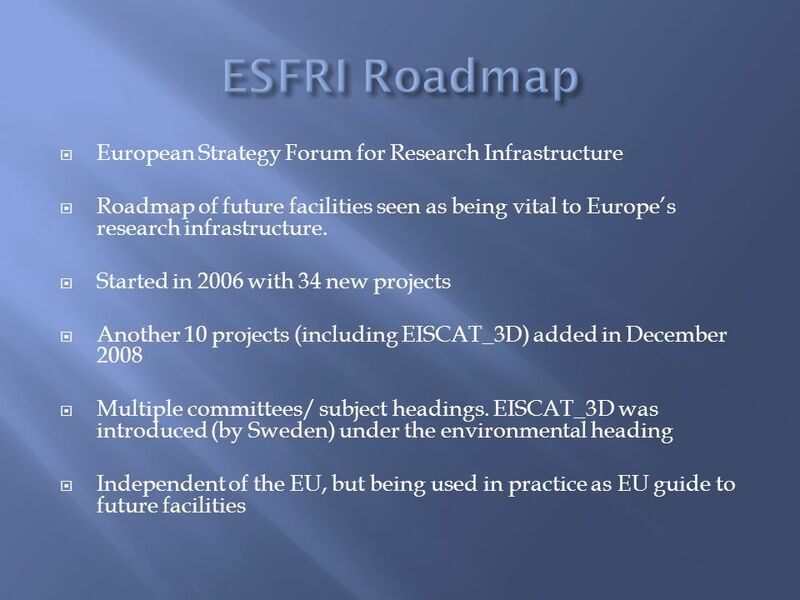 8  Swedish Research Council (VR) – original sponsors of the EISCAT-3D project into ESFRI. Involvement very valuable in co-ordination and logistics area. 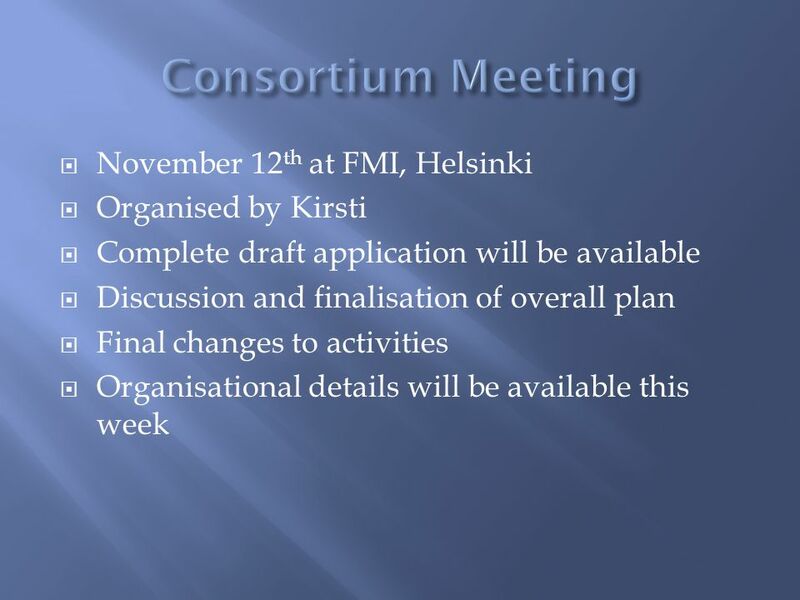 Involvement to be confirmed (or not) next week.  Swedish National Infrastructure Centre (SNIC) – Responsible for national e-infrastructure activities (computing, storage, networking). 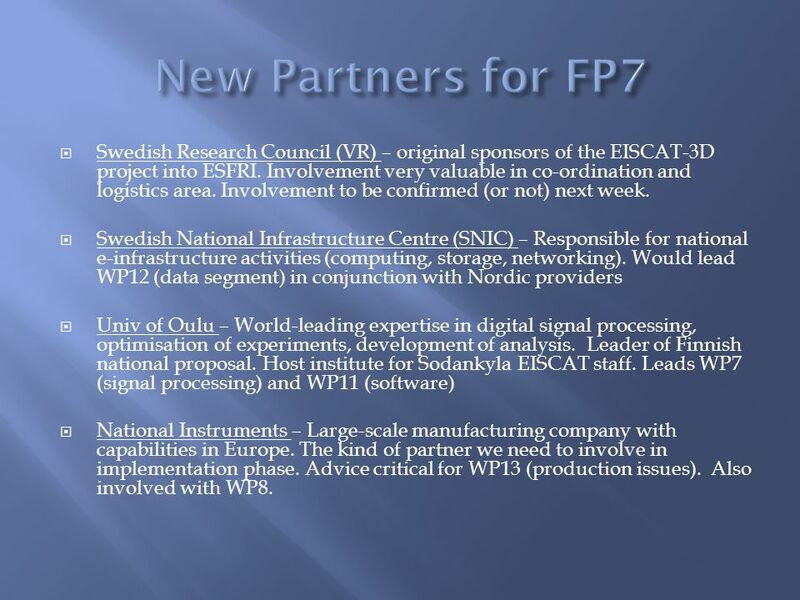 Would lead WP12 (data segment) in conjunction with Nordic providers  Univ of Oulu – World-leading expertise in digital signal processing, optimisation of experiments, development of analysis. Leader of Finnish national proposal. Host institute for Sodankyla EISCAT staff. Leads WP7 (signal processing) and WP11 (software)  National Instruments – Large-scale manufacturing company with capabilities in Europe. The kind of partner we need to involve in implementation phase. Advice critical for WP13 (production issues). Also involved with WP8. 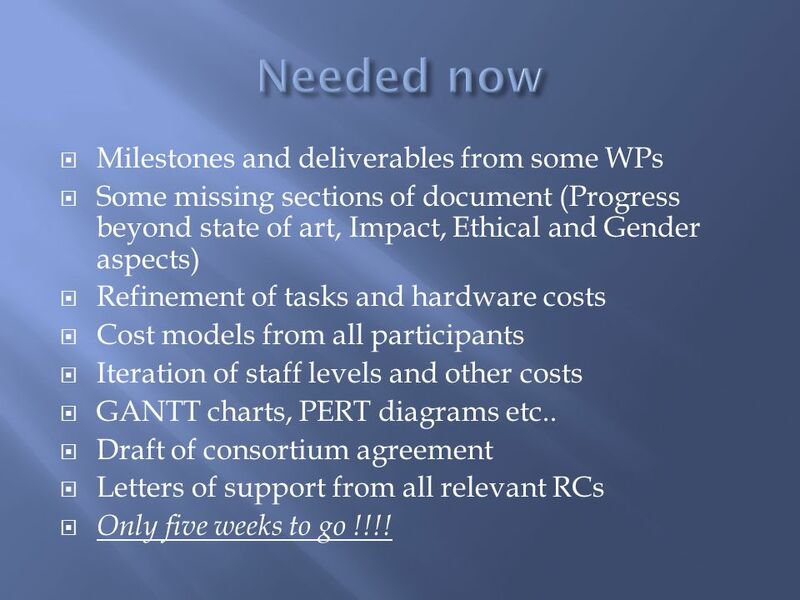 13  Milestones and deliverables from some WPs  Some missing sections of document (Progress beyond state of art, Impact, Ethical and Gender aspects)  Refinement of tasks and hardware costs  Cost models from all participants  Iteration of staff levels and other costs  GANTT charts, PERT diagrams etc..  Draft of consortium agreement  Letters of support from all relevant RCs  Only five weeks to go !!!! 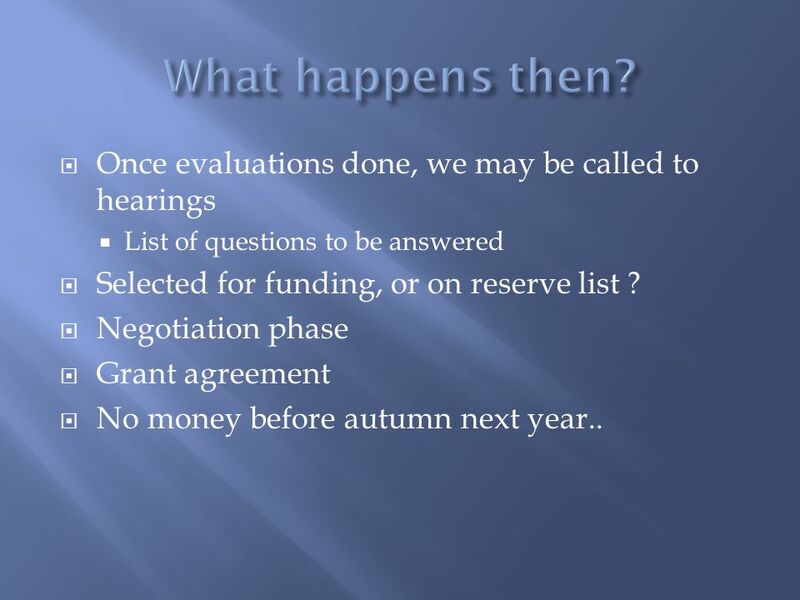 16  Once evaluations done, we may be called to hearings  List of questions to be answered  Selected for funding, or on reserve list ? 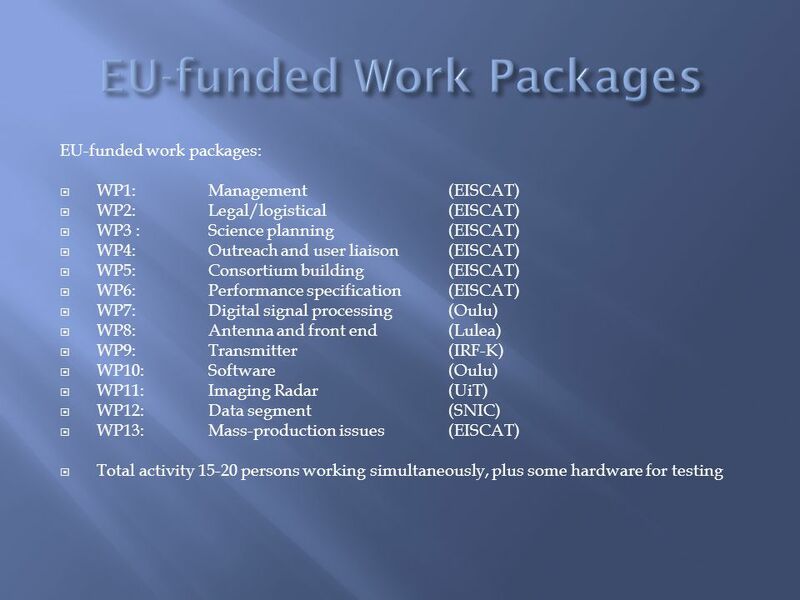  Negotiation phase  Grant agreement  No money before autumn next year..
21  Essentially this is the work programme of WP12  What effect does final signal processing philosophy have on our calculated data rates? 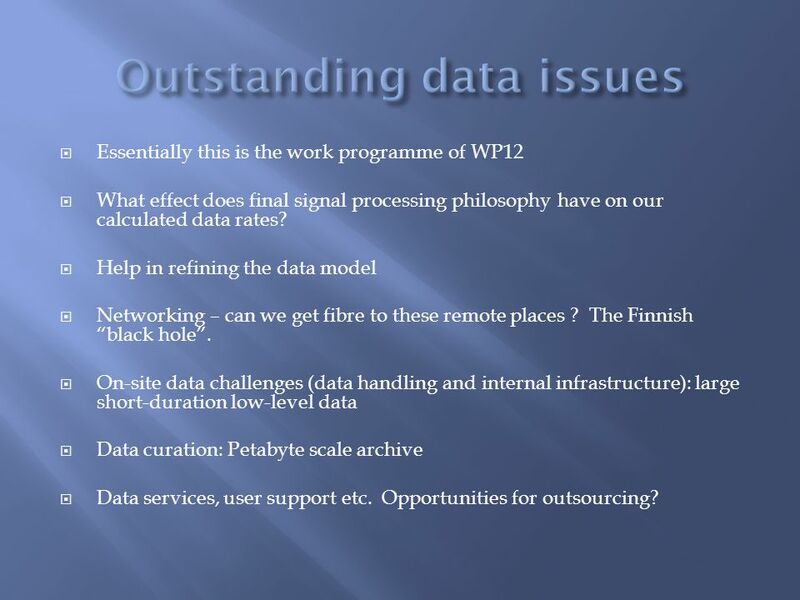  Help in refining the data model  Networking – can we get fibre to these remote places ? 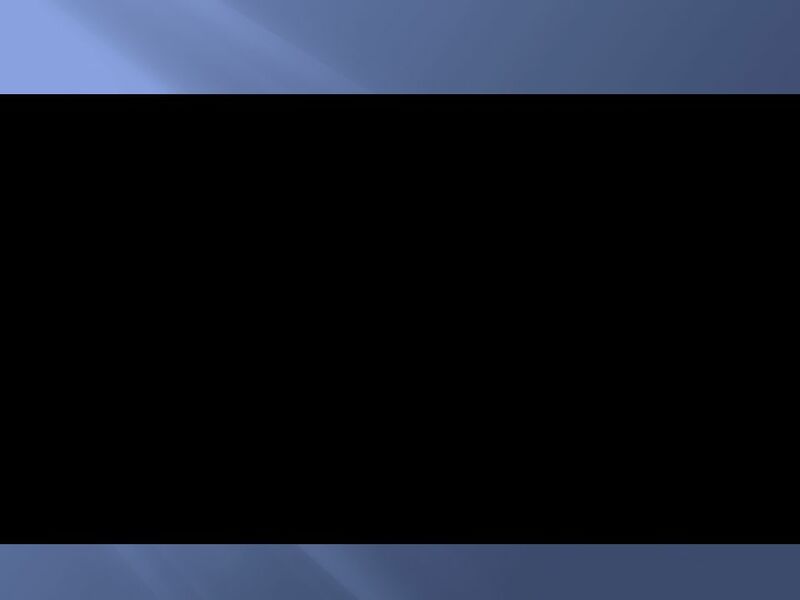 The Finnish “black hole”.   On-site data challenges (data handling and internal infrastructure): large short-duration low-level data  Data curation: Petabyte scale archive  Data services, user support etc. Opportunities for outsourcing? 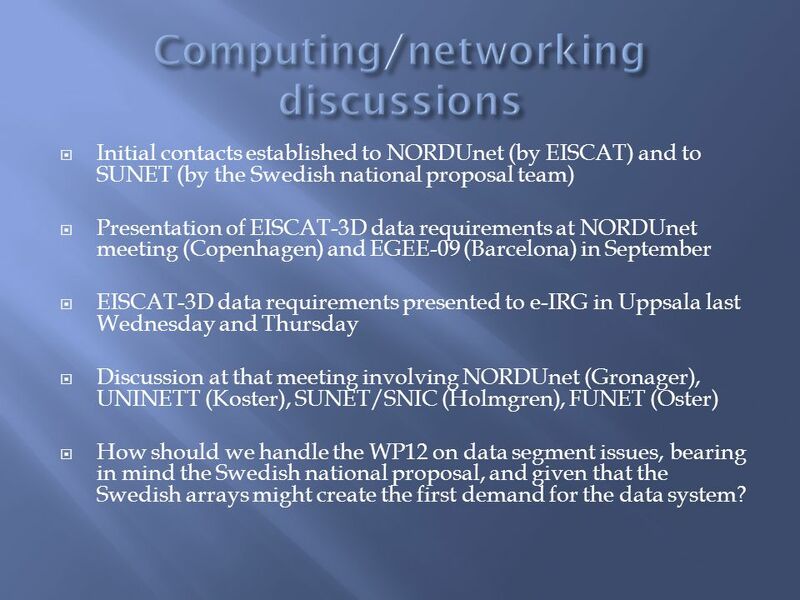 22  Initial contacts established to NORDUnet (by EISCAT) and to SUNET (by the Swedish national proposal team)  Presentation of EISCAT-3D data requirements at NORDUnet meeting (Copenhagen) and EGEE-09 (Barcelona) in September  EISCAT-3D data requirements presented to e-IRG in Uppsala last Wednesday and Thursday  Discussion at that meeting involving NORDUnet (Gronager), UNINETT (Koster), SUNET/SNIC (Holmgren), FUNET (Oster)  How should we handle the WP12 on data segment issues, bearing in mind the Swedish national proposal, and given that the Swedish arrays might create the first demand for the data system? Download ppt "Ian McCrea Rutherford Appleton Laboratory UK. 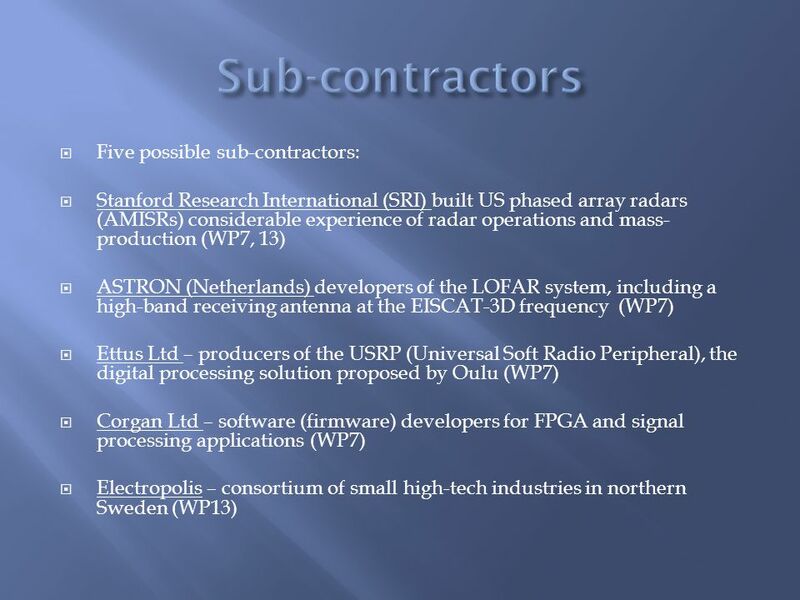  Orginal concept (E-Prime) in 2002  EISCAT_3D Design Study (FP6) proposed 2004  Funding €2.8M over four." WBC-INCO.NET WP3 – Report on opportunities to access S&T Infrastructures Davor Kozmus, MHEST Steering Platform Meeting 29. October 2009, Zagreb. – Seoul December 06 ERCIM Preparing European proposals Bruno Le Dantec ERCIM EEIG France – Seoul December 2006. Research Careers and Development Framework 22nd August 2012. Success factors in grant applications and research projects: seminar. 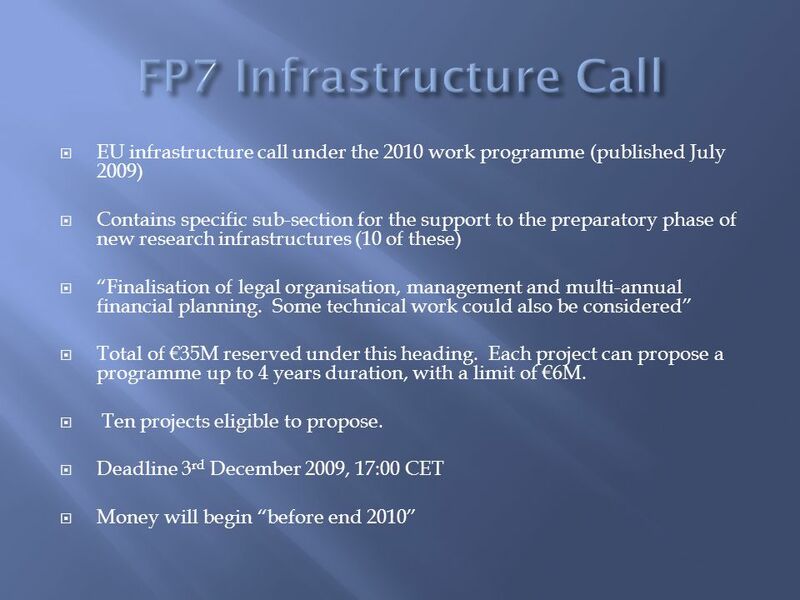 Helsinki Sept 2007 S.Galés ERA-NET Supporting Cooperation for research infrastructures in all S&T fields 7 th FP Call Capacity Work Program: Infrastructures. AAL2 Active and Assisted Living Research and Development Program Presentation for the Symposium on Active Healthy Home 23 oktober 2014 Greet Bilsen. 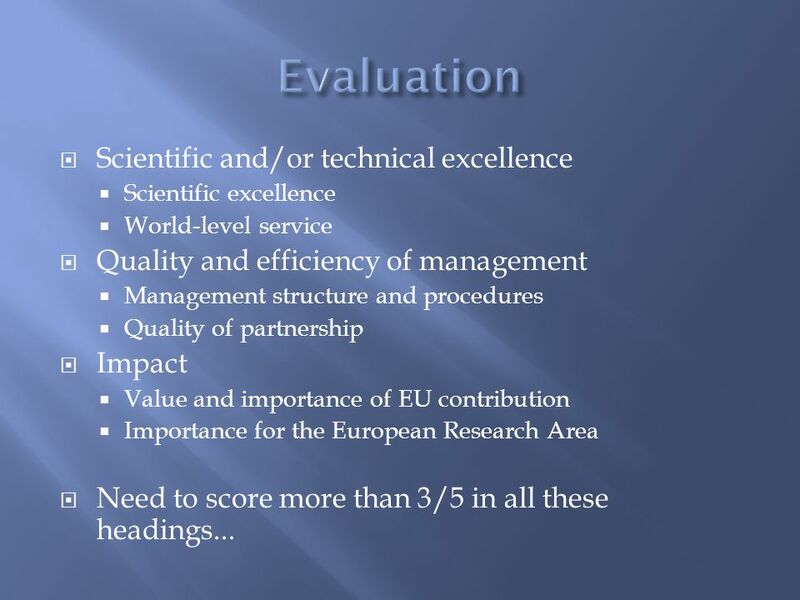 EVALUATION AND QUALITY ASSURANCE STRATEGY PRESENTED BY DR SHYAM PATIAR. 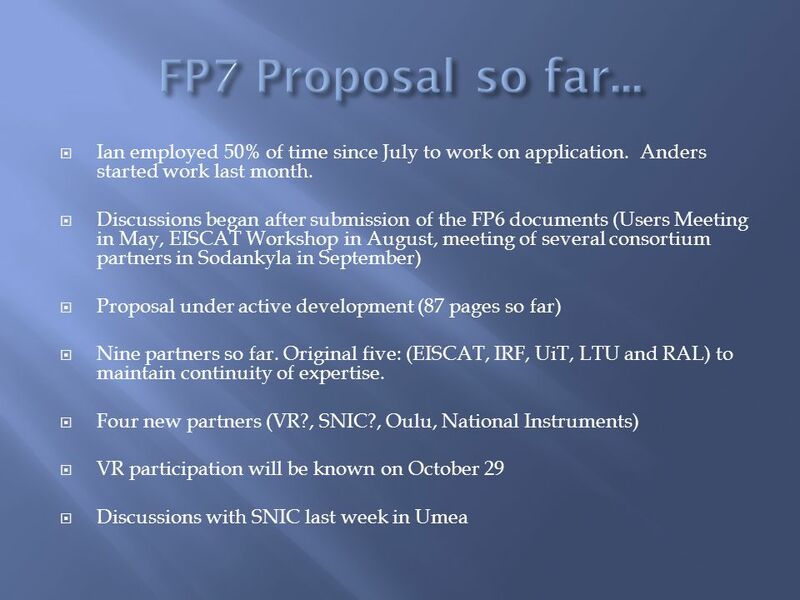 Developing an FP6 Proposal and How We Can Help METU - Office of EU Affairs. Work Package 6: Performance Specification Ian McCrea. APRE Agency for the Promotion of European Research Lifecycle of an FP 7 project Caterina Buonocore Riga, 13th September, 2007. 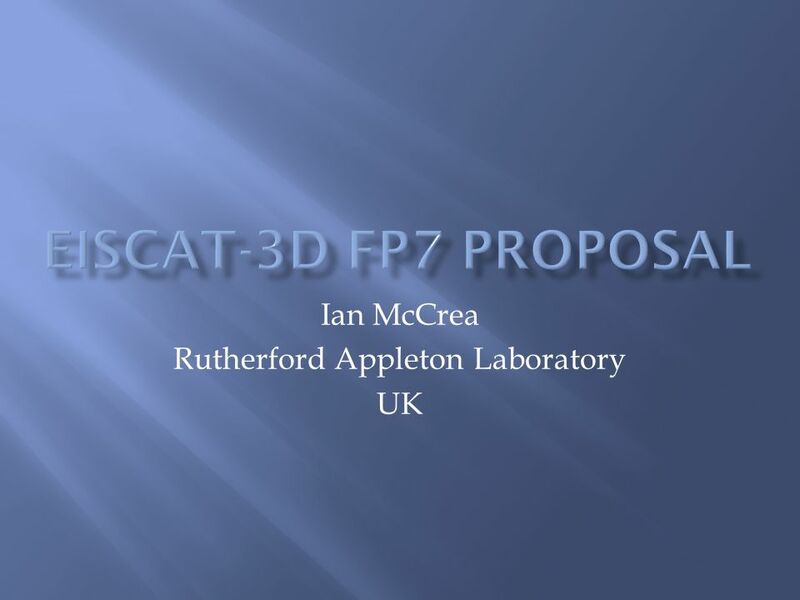 The EISCAT_3D Preparatory Phase Ian McCrea STFC Rutherford Appleton Laboratory On behalf of The EISCAT_3D Project Team. TIARA WP2 Report and wrap-up Final Annual Meeting R. Aleksan Nov. 27 th, 2013. WP leaders meeting R. Aleksan October 5 th, 2009 TIARA 1.Objectives 2.General Context 3.Building TIARA 4.Conclusion.